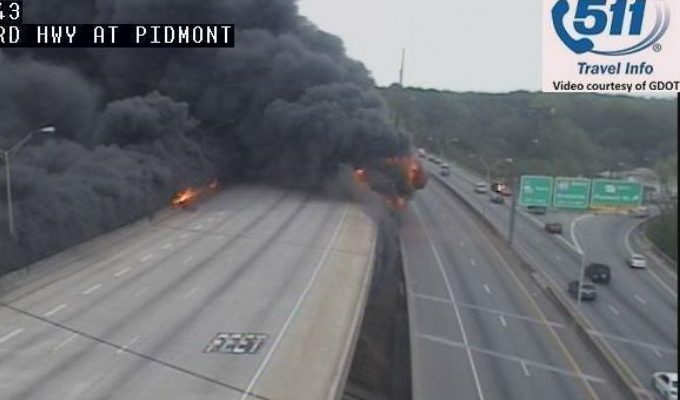 The City of Atlanta suffered a crippling fire yesterday that’s going to tie up traffic in the area for months to come. A large plastic tubing storage area underneath a bridge on Interstate 85 near downtown Atlanta caught fire and the resulting heat weakened the bridge structure causing it to collapse. Highway officials and engineers say the damage isn’t limited to just the section of bridge that collapsed but also to adjacent roadways. The bridge collapse has shut down a major artery into downtown Atlanta that carries hundreds of thousands of cars each day. Since there’s no idea yet on the extent of the damage, there’s no word on how long repairs will take. Needless to say, Atlanta traffic is going to reach even greater nightmarish levels over the coming days and months. In past articles, I’ve written nostalgically about my early days learning to drive in the City of Atlanta. For a while, I even worked as a tour guide, driving passengers in a small bus to all the interesting sights in and around the city. In those days, Atlanta drivers took great pride in their courtesy to each other. In fact, my tourists used to comment on how courteous the drivers were in Atlanta compared to their home cities. Those days are long gone! The explosive growth of businesses in and around Atlanta brought millions of people from other parts of the country to Atlanta in search of jobs. The population of metro Atlanta swelled from just over a million people when I graduated from high school to almost six million today. Many of those transplants from other areas of the country brought their bad driving habits with them and the folks with bad driving behaviors soon supplanted the older, more courteous native Atlantans. Their driving behavior became so bad that Atlanta is now listed among the top cities with the worst aggressive drivers and road rage incidents according to periodic surveys by AutoVantage, an online insurance company. In fact, Atlanta passed New York and Miami in the road rage rankings. The collapse of the I-85 bridge is going to test Atlantans in ways not seen since General Sherman’s visit in 1864. If Atlantans stick to their current driving behaviors there’s going to be a lot of chaos on Atlanta roadways. There are going to be a lot more incidents of road rage, car crashes, and, unfortunately, a lot more deaths and injuries than normal. It even goes so far as to mean allowing other drivers to enter the roadway ahead of you. Allowing another driver to enter the road in front of you costs very little time and will avoid those dangerous maneuvers by drivers trying to force their way into traffic. If Atlantans were to try this radical new idea, they’d probably be very surprised to find that traffic will flow much more quickly and smoothly. It’s the smartest and safest thing to do. If not, they should run to their hairstylist, get a Mohican haircut, put on the spiked hubcaps, and mount the harpoons and mini-Gatling guns to the hoods of their vehicles because it’s going to be just like a Mad Max movie. « Eclipse 2017 – Avoid the Roads!